Updated: 8:34 p.m. | Posted: 1:33 p.m. Protesters with their arms in the air, chanting, "Hands up! Don't shoot!" 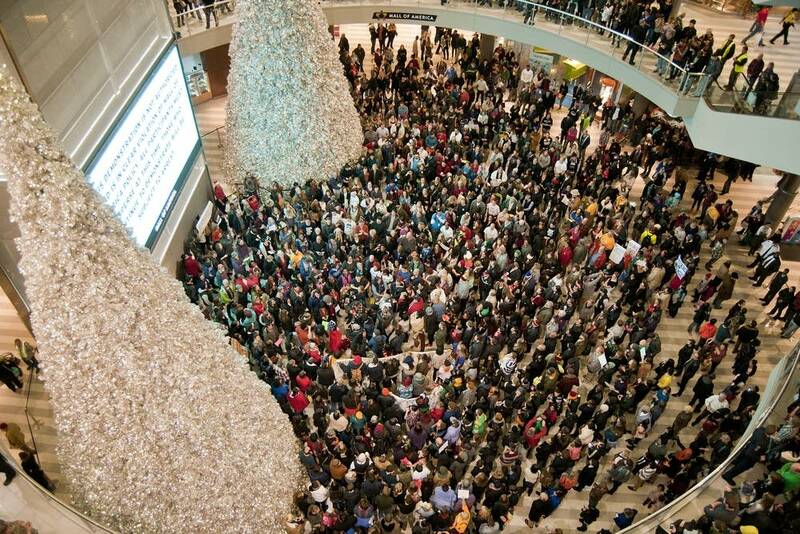 walked through the Mall of America Saturday afternoon, while others gathered in the building's rotunda amid stories-high silver Christmas trees, chanting "Black Lives Matter." 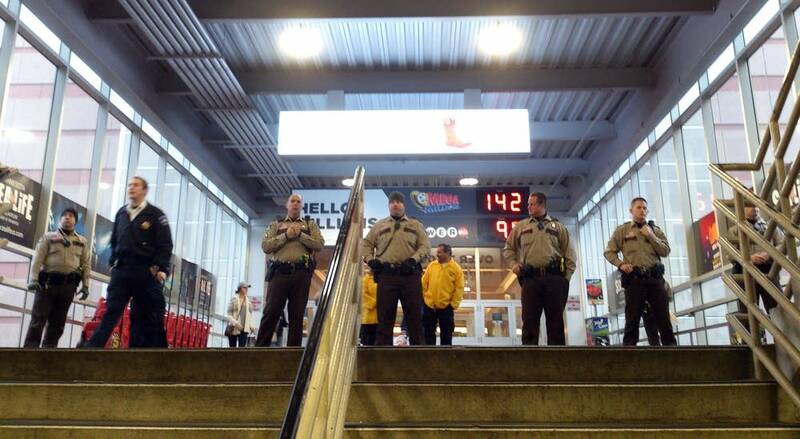 Police officers stood silently nearby during the mostly peaceful demonstration. The mall is considered private property, and has a longstanding policy banning political demonstration. Some protesters left the building soon after the chanting died down, but others lingered, and were told to disperse or face arrest. Bloomington Police Department spokesman Capt. Mark Stehlik said 25 people were arrested. Stehlik estimated at least 1,500 demonstrators attended the protest, but said it was a conservative projection. Protest organizers put the number at 3,000. Whatever the number, the group was largely peaceful and highly organized. Organizers of the group Black Lives Matter Minneapolis said earlier in the week that they had been warned they could be arrested and banned from the property for a year, but decided to go through with the protest despite the warnings. The group planned the demonstration as part of a wave of protests nationwide following grand jury decisions not to indict police officers who killed unarmed black men they confronted in New York and Missouri. Black Lives Matter Minneapolis was also behind the demonstration that blocked Interstate 35W earlier this month for hours, then rallied at Minneapolis City Hall protesting police brutality. At that demonstration, protesters chanted "I can't breathe," reportedly the last words of Eric Garner, who was subdued in a chokehold by New York City police. It's become a rallying cry for those protesting police brutality. The crowd chanted slogans about the recent deaths of Michael Brown in Ferguson, Eric Garner on Staten Island and Tamir Rice in Cleveland. They also tried to leaven the tragedies with some holiday cheer. "Black lives they matter. It's time to let them know. Injustice anywhere is injustice for us all. Oh, oh, oh!" Organizer Michael McDowell said earlier this week that the 2 p.m. demonstration would be a peaceful gathering to protest police brutality. He said organizers' plans involved singing "Christmas carols with a twist." By 1:45 p.m., onlookers, protesters, shoppers — it was difficult to distinguish among them — had begun to gather on the floors and galleries overlooking the mall's central rotunda. Early into the protest, a voice on the mall's public-address system repeated, "This demonstration is not authorized," and flashed a similar message on a large screen above the rotunda. Protesters responded by lying down on the floor. The Mall of America set up security checkpoints at its main entrances in anticipation of the event, which came at the height of the final pre-Christmas shopping rush. 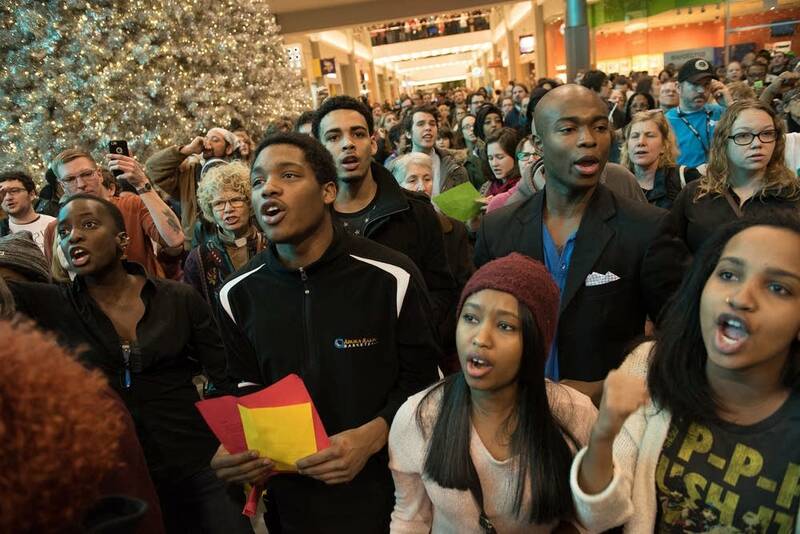 The connection wasn't lost on protesters, who chanted "While you're on your shopping spree, / Black people cannot breathe." While the din was overwhelming in and around the mall's rotunda, it was tough to hear elsewhere in the building, as the echoes faded down the broad hallways. Some confused shoppers encountered the demonstration while heading for the mall's east-side parking ramp. About 100 protesters chanting "Put your hands up" marched in front of shops on the west side of mall, away from the main protest. Some nearby shoppers cheered. By 2:50 p.m., after the chants had slowed and some of the group had begun to disperse, heading toward the exit and chanting, "No justice, no peace. / Prosecute the police." Organizers sent a text message to protesters, congratulating them and asking them to move out of the building. The sign above the rotunda flashed a final warning, saying the demonstration must end or protesters could be arrested. Officers told members of the crowd to disperse. By the end of the demonstration, which lasted roughly an hour, access to sections of the mall's east side — including the rotunda — had been closed off to protesters and shoppers alike, leaving people stuck in sections of the building and its parking ramps. Security officers closed about 80 stores in the east wing during the protest. 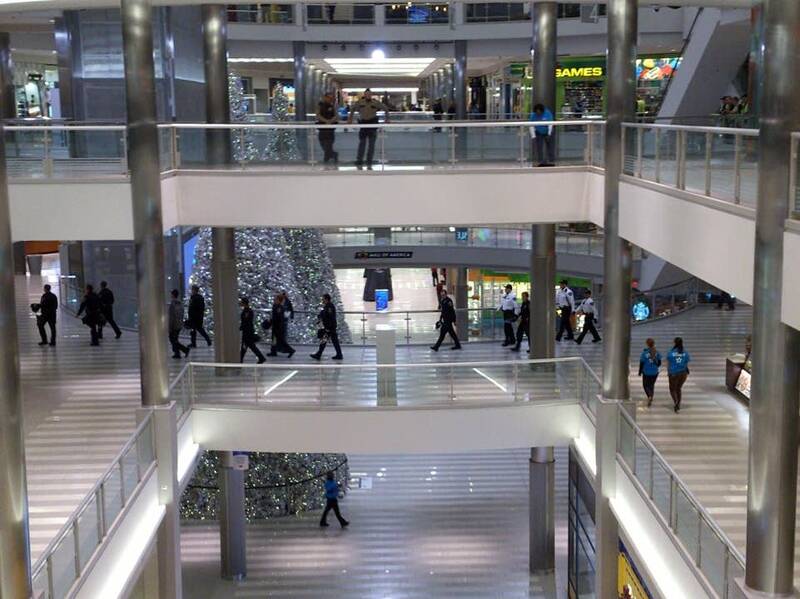 At 4:15 p.m. on the final Saturday before Christmas, the Mall of America looked deserted. About 20 minutes later, stores had reopened, and shoppers began trickling back in to the rotunda and other areas that had been temporarily closed. • Explained: Where is protest allowed in Minnesota? Mall of America vice president Dan Jasper says that caused economic hardship for the employees on a busy shopping day the weekend before Christmas. 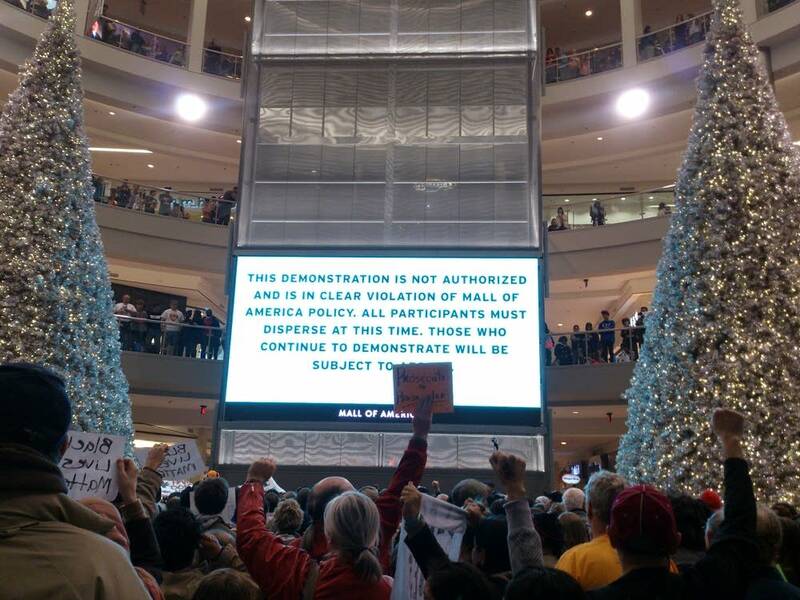 "A lot of those jobs that are at Mall of America are commission jobs. This week is incredibly important to them, and this did have an impact on them." More than 100 police officers were on hand for the protest. Bloomington Police Commander Mark Stehlik says he wished protesters had taken the city up on its offer to hold the event on nearby public property. "Once it was clear that it was going to take place, our goal was to end it as quickly as we could," he said, "and our primary goal was to ensure the safety and security for the people in the mall — the guests, the tenants, the cops involved, the protesters involved — and to that end, that was successful." Stehlik says as far as he knows no one was hurt and no property was damaged. The demonstrators began in the building's rotunda, then marched outside a blocked a street for about 20 minutes. That's when Curtis Mayfield Jr. encountered them. The Iraq War vet, who says he's the son of the late music legend Curtis Mayfield, was ringing a bell for the Salvation Army. He put it down and joined the crowd. Instead of chanting "Black Lives Matter," though, Mayfield made it "All Lives Matter." "My father wrote a song, heaven or 'hell below, if there's one, we're all going to go,'" he said. "We people that are darker than blue, we struggle so much but it's just the beginning of equality for all life, not just black lives, all lives." But he says he supports the protesters' cause just the same. There were also demonstrations this weekend in other cities. On Friday night more than 70 people were arrested in Milwaukee after they shut down a road to protest a police shooting of a black man there earlier this year. MPR News' Mike Edgerly and Meg Martin contributed to this report.